The Town of Kirkland's logo used to identify the municipality is its official signature. Easy to recognize and distinctive, the logo is contemporary of the Kirkland of today. Designed by Tom Pedricks, the Kirkland logo evokes both a tree and a maple leaf. It also incorporates several elements, the colours of which symbolize the environment: green for the foliage, blue for the water and white for the air. The letter K illustrated in green as part of the three Vs stands for Kirkland and their six points represent the six municipal electoral districts at the time. The central pillar symbolizes the Town Hall's atrium that is the community's meeting point, where strength lies in numbers. 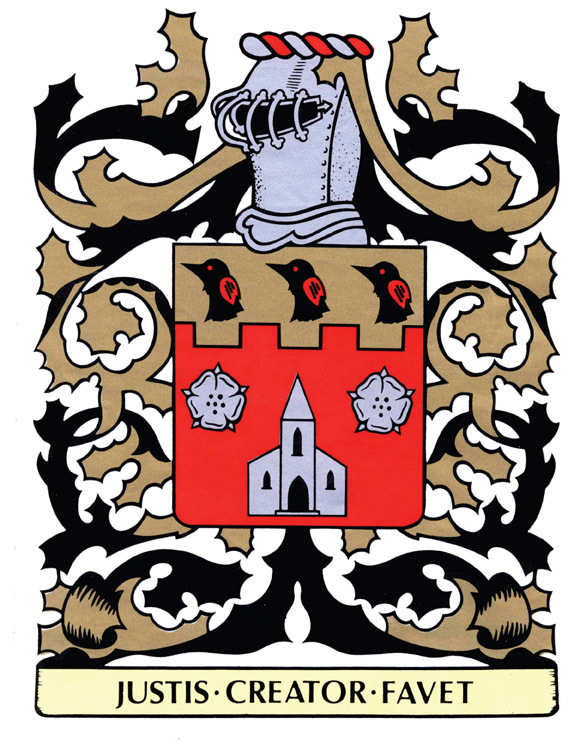 In the late 1960s, the municipal council adopted a new coat of arms which became the visual identity of the town. It had been the coat of arms of Dr. Charles A. Kirkland. This was designed by the Canadian Heraldic Authority and presented to the doctor by the Ville Saint-Pierre administration where he was Mayor at the time. The red colour used in the shield symbolizes the courage and strength to stand up for what is right. The church is a reminder of the meaning of the word Kirk which is church in Scottish. The three birds symbolize geese, from Charles-Aim� Kirkland's father's name Oatis which is the scientific name for Outarde (French for Goose). The motto in Latin JUSTIS-CREATOR-FAVET translates into The Creator Favors the Just. 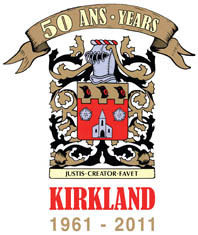 The choice of the municipality's coat of arms  The Kirkland family crest  as a visual identity for the town's 50th anniversary celebrations demonstrates the importance the town attaches to its origins. Since October 2010, the new logo for the Kirkland Library is a bird in flight. Modern and colourful, this bird has an open book between its wide-spread wings evoking themes of openness, free spirit and imagination. This literary flight, the library itself in fact, reflects not only the essential tools for self-fulfillment, but also the discovery of arts and culture. The library is a tool that guides patrons through books into taking flight in many forms. This could translate into learning the alphabet, becoming a better person or being carried away to a different world through literature.